A common mistake gardeners make is adorning their flower beds with plants that appeal to them visually with little thought given to their impact on the environment. 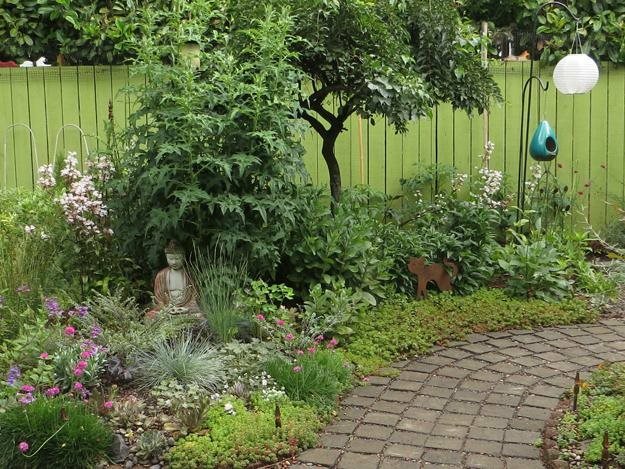 Yet it’s possible to have the best of both worlds—a garden that not only delights the eye, but also benefits the native habitat. A paver walkway meanders through the back garden, under the watchful eyes of a concrete Buddha, which sits among Echinops ritro. Also in the mix are Hebe ‘Quicksilver’, Penstemon ‘Husker Red’, and a variety of Pacific Northwest natives such as Sedum oreganum, Juncus effusus, Armeria maritima, and Penstemon serrulatus. That ideal blend of beauty and sustainability was achieved by Tamara Paulat in her charming Pacific Coast garden in Portland, Oregon. Her entire yard (which she calls “Chickadee Gardens”) is populated with a carefully chosen mix of native and ornamental plants that are kind to the environment while echoing the architectural style of her 1929 Spanish Revival home. 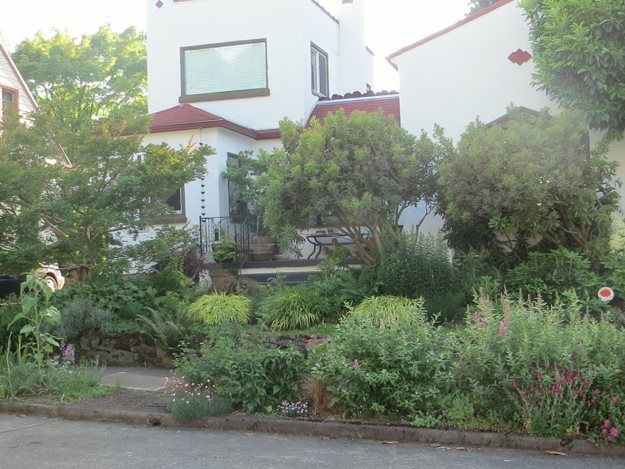 Paulat’s Spanish Revival style home is unusual in the Pacific Northwest, and she has selected plants that enhance its architecture yet thrive in their native habitat. Spiraea douglasii with fluffy pink blooms were planted as an alternative to invasive butterfly bush or buddleia. The two small trees, which were there when Paulat bought the house, are Myrica rubra-relatively unknown around the West Coast but common in Japan. She simply pruned them to bring in more light and air circulation. An Acer circinatum (vine maple) in a terra-cotta pot on the front porch echoes both the Spanish influence of the home while being native to the Pacific Northwest. 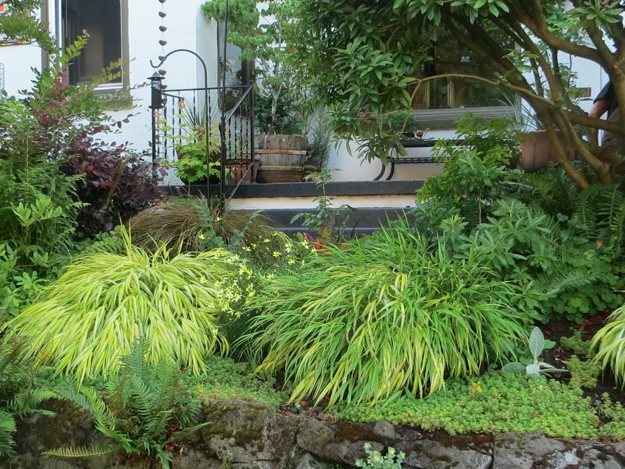 Hakonechloa macra ‘Aureola’ in the front garden gets morning sun and afternoon breezes. 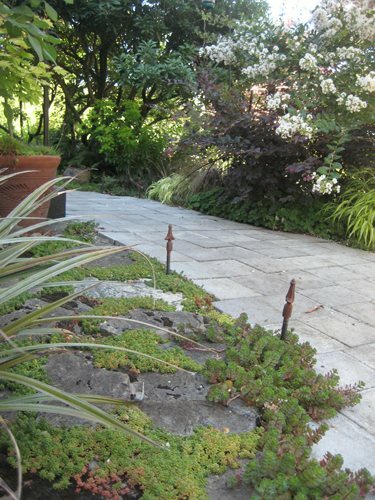 Native Sedum oreganum serves as a groundcover underneath native sword ferns that have naturalized in the rock wall. Coreopsis ‘Moonbeam’ tucked in between attracts pollinators. “Just because native plants are in your garden does not mean they are zero maintenance. There are shade-loving perennial natives as well as chaparral natives and hot, hot desert natives within a short distance of one another at my home. Some like wet woodland conditions, others hot and dry. Give them what they would find in in their natural habitat,” she says. A variety of sedums and Astelia nivicola ‘Red Gem’ line the path up to Paulat’s front door. The flowering tree on the right is Lagerstroemia x ‘Natchez’. Some of Paulat’s favorite plants include Sedum oreganum, Aruncus dioicus, Armeria maritima, Ribes sanguineum, Oxalis oregana, Spiraea douglasii, Heuchera 'Marmalade', Hebe ‘Champion’, Agave ‘Blue Glow’, and Adiantum aeluticum. Ornamentals, such as Yucca rostrata, Rosa ‘Eden’, planted for its beautiful rose hips in the fall, provide both visual and wildlife benefits. She meticulously selects plants that work well in each “microclimate” in her yard, which has both full sun exposure and shaded areas. Her rule of thumb is finding the right plant for the right place. 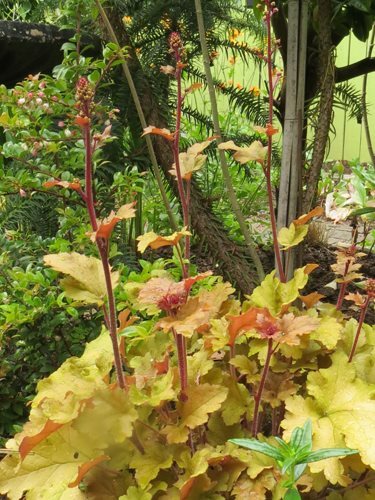 One of Paulat’s favorite plants is Heuchera ‘Marmalade’. “It has proven to be not only sun-tolerant, but shade and drought tolerant too. It just gets bigger and better every year,” she says.